Northwest Auto and Truck Accessories stocks Thule Racks and Yakima Racks. We have a large selection in stock and expert advice on the product that fits your needs. Looking for hitch mounted bike racks? We are your one stop rack center. Professional installation on most models is free! One-handed throw-hood design fits 12mm to 20 mm thru-axles and 9mm quick release hubs (with included adapter). Expanding wide-jaw clamp accommodates a bike's thru-axle with no loose parts for easier bike loading. D-shaped low profile tray designed for better aerodynamics and to withstand the elements. One-key lock cylinder (sold separately) locks the bike to the carrier and the carrier to the rack (thru-axles only). Holds the bike upright while you secure the bike to the mount. Zero contact with the bike frame. Accommodates disc brakes, thru axles and full suspension. Carries your complete bike – no front wheel removal necessary. Fits 20” to 29” wheels, mountain and road bike wheels (except tandems and recumbents). 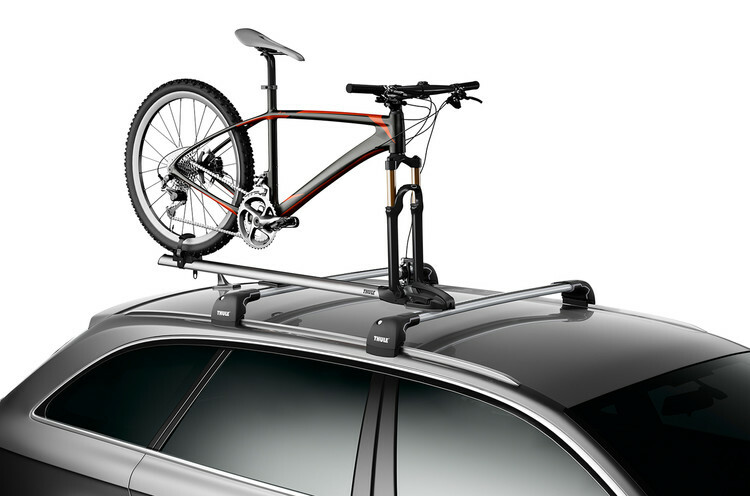 If you want the most bang for your buck in the top of car bike world than the Yakima Viper is your rack. Simple tool-free installation and removal of the bike mount from your car roof rack. Skewer design allows one-handed adjustment. Streamlined tray compatible with most disc brakes. Doesn’t touch the painted surfaces of your bike. Lockable skewer keeps your bike safe and sound (SKS Lock Cores sold separately). Your advanced bike design demands the highest level of style and sophistication from your rack. Sleek design with automotive finish. Fits fat and skinny tires. Easy to adjust sliding wheel tray makes positioning read wheel a breeze. Double-sided wheel strap for use on either side of your car. Super strong and wide wheel tray supports all bike sizes except tandems. Premium wheel tray with double-sided strap accommodates everything from road to downhill bikes with tire widths up to 3”. Those of us who aren't trust fund babies or rap music moguls shouldn't have to pull off a bank heist just so we can afford a nice upright bike mount. And we shouldn't need to take off the front wheel to use it, either. Fits 1" to 3" diameter downtubes (most shapes and frame materials). Secures wheels with ratcheting wheel straps. Fits round and square crossbars equally well. Compatible with factory crossbars when you add MightyMounts (SOLD SEPARATELY). No problem handling disc brakes or thru axles.